For almost sixteen years the Pacific Northwest group Agalloch has carved out a multifarious sound consisting of black metal, folk, progressive rock, and ambient soundscapes that has marked them as a pioneer in the contemporary dark music scene. Their dynamic approach to metal began with the demo From Which of this Oak released in 1997. This demo exhibited a deep connection with the early recordings of bands like Ulver, In the Woods, and Katatonia. The band released one more demo before securing a three-album deal with The End Records resulting in the releases Pale Folklore (1999), The Mantle (2002), and Ashes Against the Grain (2006). In between each of these full-lengths the band pushed on the flexible boundaries they had developed around themselves through a series of limited releases that found the band experimenting with post-rock/experimental rock (The Grey EP, 2004), and neo-folk/psychedelic folk (The White EP, 2008). Beginning in early 2003 the band began performing live. Their stripped down and explosive live shows stretched from the west coast to the east coast of the US all the way through central Europe. Recently the band performed two sold out shows in Romania and was the first metal band to perform at the historical Reduta Cultural Center in Brasov. In late 2008 the band’s live performance was captured on DVD in Belgium and released under the title The Silence of Forgotten Landscapes (Shiver Records). In their eight year history of playing live Agalloch has had the pleasure of performing with such diverse groups as The Gathering, Dornenreich, Alcest, Subarachnoid Space, OvO, Satyricon, Saturnus, and many others. 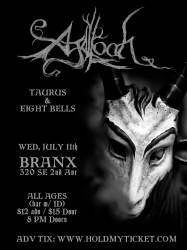 Such varied lineups are a testimony to the ease with which Agalloch can cross musical genres and styles.